RI.MOS develops and improves the design of products in cooperation with physician and scientific researchers. R&D and engineering are carried out internally and the manufacturing process involves highly experienced operators and suppliers in the manufacturing of medical devices. Thanks to a modern production technology, RI.MOS products are assembled by trained operators in a Class 10,000 clean room. RI.MOS quality system is Vision 2000 certified. • a possible immunity stimulation with local and general effects due to a defence mechanism outburst from the dermis elements forming part of the immunity system. 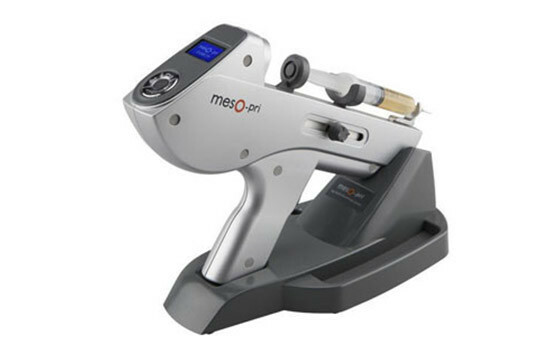 The main clinical indications of mesotherapy are first of all the painful diseases, in particular, the diseases of the locomotory apparatus, peripheral vascular diseases, hydro lipodystrophies, dermatological diseases, headaches. Injections are performed in the areas where the symptoms of the diseases manifest and spread out. RIMOS is the first company in the world to design, manufacture and sell disposable multi-injectors for mesotherapy. Rimos has developed a range of mesotherapy products which are distributed both nationwide and internationally. This injecting technique has been used increasingly for the last 40 years all over the world. In Italy, mesotherapy is now a part of common medical practices and is used both in the private consulting rooms and public health facilities. Mesotherapy represents a new method for introducing drugs into the organism. Mesotherapy is a therapeutic methodology belonging to allopathic or homeopathic medicine; it consists of injecting small quantities of drugs into the areas of skin corresponding to the injured or painful organ by intradermal or superficial subcutaneous multiple injections. It is a technique of intradermal injections that allows reducing the number of drugs. Doses are reduced by the half or one third causing a decrease of secondary effects and iatrogenic problems. At the same time, there is a prolonged curative effect accompanied by a higher therapeutical effectiveness and rapidity of action. The injected drugs belong to the official Pharmacopeia and are chosen according to the general medical practice and following a traditional precise diagnosis.